This mantua was made for a doll, known as Lady Clapham, that is thought to have belonged to the Cockerell family, descendants of the diarist Samuel Pepys (1633-1703). The daughter of Pepys's nephew John Jackson (the son of his sister Pauline) married a Cockerell, who had a family home in Clapham, south London. Doll's mantua of ivory Chinese export silk damask with a train at the back. 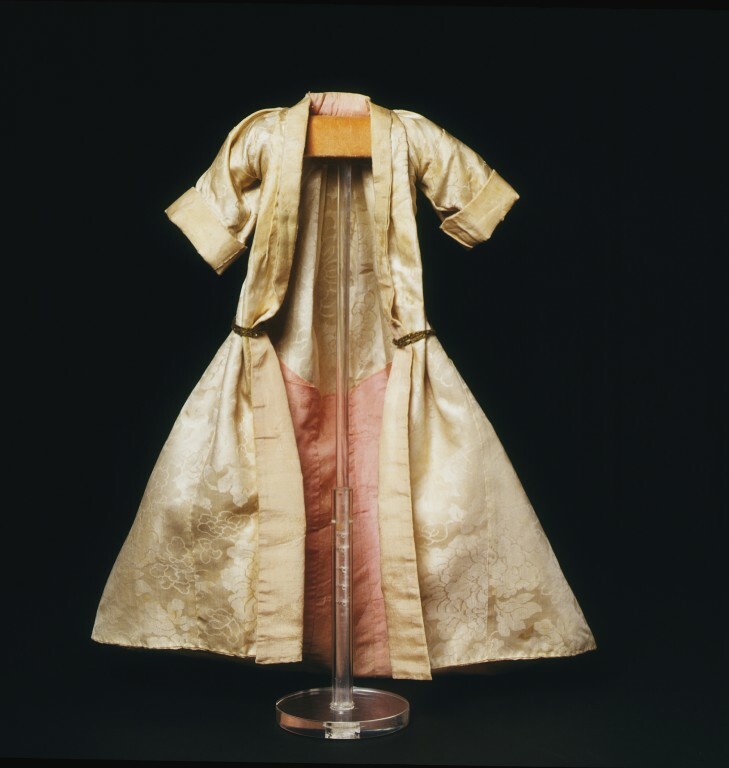 The train is lined and faced with self-patterned pink silk taffeta with a self-coloured woven pattern which also forms the robing and turn back cuffs. The mantua is T-shaped with a sack back and a gore from the waist to hem at each side. The mantua has a double box pleat at the back and wide three-quarter length sleeves. A cord of metal braid stitched inside the waist, attached to a gilt thread metal button attached to each hip holds the mantua open over the petticoat.